There are currently 178 online users. Simbakubwa kutokaafrika ("great lion from Africa") is an extinct species of mammal of the family Hyainailouridae in the order Hyaenodonta. It lived during the early Miocene and was found in Kenya. The type specimen was recovered from deposits dated to be 23 millions years old. 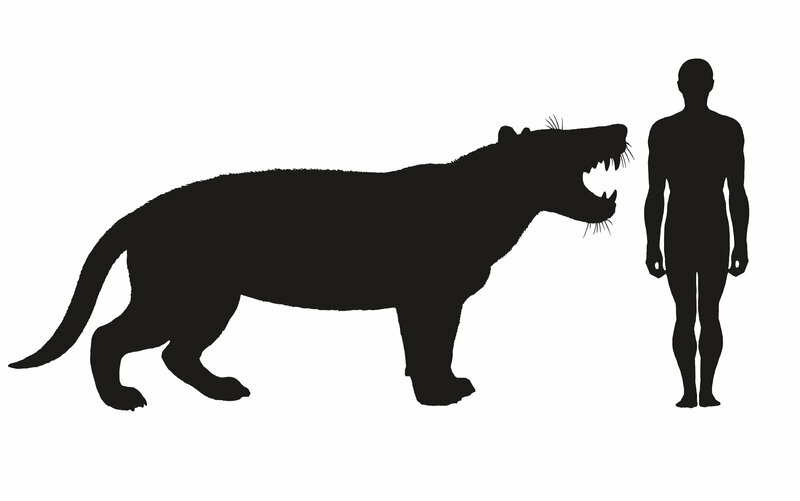 Reaching up to 1,500 kg (3,300 lb), it was seven times bigger than an adult Lion and surpassed the modern Polar Bear in size. The fossils of Simbakubwa were first discovered by Matthew Borths and Nancy Stevens when they were examining fossils stored at the Nairobi National Museum in Kenya. The type specimen consists of a mandible from the lower jaw, a right upper maxilla and some post cranial remains. The light wear patterns on the dentition indicate that the holotype specimen was a young adult at the time of its death. The study of the postcranial remains indicates Simbakubwa was possessed of a semi-digitigrade walking stance. Simbakubwa, like other hyainailourids, probably was a specialist hunter and scavenger that preyed on creatures such as rhinoceroses and early proboscideans. It may have been somewhat less specialized in crushing bone than its later relatives such as Hyainailouros. However, like Hyainailouros, Simbakubwa possessed lingually rotating carnassial blades, ensuring a constant shearing edge throughout its life. Paleontologists at Ohio University have discovered a new species of meat-eating mammal larger than any big cat stalking the world today. Larger than a polar bear, with a skull as large as that of a rhinoceros and enormous piercing canine teeth, this massive carnivore would have been an intimidating part of the eastern African ecosystems occupied by early apes and monkeys. In a new study published in the Journal of Vertebrate Paleontology, the researchers name Simbakubwa kutokaafrika, a gigantic carnivore known from most of its jaw, portions of its skull, and parts of its skeleton. The 22-million-year-old fossils were unearthed in Kenya decades ago as researchers canvassed the region searching for evidence of ancient apes. Specimens were placed in a drawer at the National Museums of Kenya and not given a great deal of attention until Ohio University researchers Dr. Nancy Stevens and Dr. Matthew Borths rediscovered them, recognizing their significance. "Opening a museum drawer, we saw a row of gigantic meat-eating teeth, clearly belonging to a species new to science," says study lead author Borths. Borths was a National Science Foundation Postdoctoral Research Fellow with Stevens in the Department of Biomedical Sciences at Ohio University when the research was conducted, and is now Curator of the Division of Fossil Primates at the Duke Lemur Center at Duke University. Simbakubwa is Swahili for "big lion" because the animal was likely at the top of the food chain in Africa, as lions are in modern African ecosystems. Yet Simbakubwa was not closely related to big cats or any other mammalian carnivore alive today. Instead, the creature belonged to an extinct group of mammals called hyaenodonts. 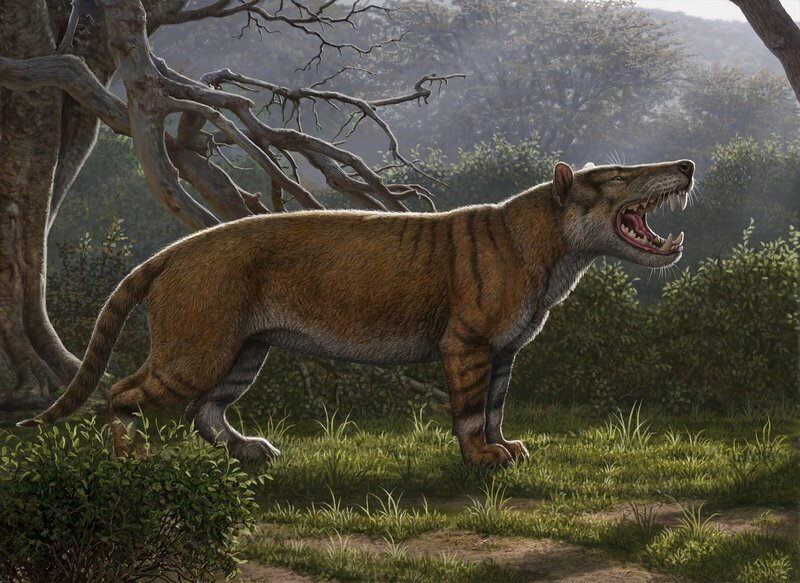 Hyaenodonts were the first mammalian carnivores in Africa. For about 45 million years after the extinction of the non-avian dinosaurs, hyaenodonts were the apex predators in Africa. Then, after millions of years of near-isolation, tectonic movements of the Earth's plates connected Africa with the northern continents, allowing floral and faunal exchange between landmasses. Around the time of Simbakubwa, the relatives of cats, hyenas, and dogs began to arrive in Africa from Eurasia. As the relatives of cats and dogs were going south, the relatives of Simbakubwa were going north. "It's a fascinating time in biological history," Borths says. "Lineages that had never encountered each other begin to appear together in the fossil record." The species name, kutokaafrika, is Swahili for "coming from Africa" because Simbakubwa is the oldest of the gigantic hyaenodonts, suggesting this lineage of giant carnivores likely originated on the African continent and moved northward to flourish for millions of years. Ultimately, hyaenodonts worldwide went extinct. Global ecosystems were changing between 18 and 15 million years ago as grasslands replaced forests and new mammalian lineages diversified. "We don't know exactly what drove hyaenodonts to extinction, but ecosystems were changing quickly as the global climate became drier. The gigantic relatives of Simbakubwa were among the last hyaenodonts on the planet," remarks Borths. "This is a pivotal fossil, demonstrating the significance of museum collections for understanding evolutionary history," notes Stevens, Professor in the Heritage College of Osteopathic Medicine at Ohio University and co-author of the study. "Simbakubwa is a window into a bygone era. As ecosystems shifted, a key predator disappeared, heralding Cenozoic faunal transitions that eventually led to the evolution of the modern African fauna." Hyainailourine hyaenodonts are among the largest terrestrial carnivorous mammals known. The clade is widely dispersed, found in Eurasia, North America, and Afro-Arabia in the Paleogene and early Neogene. In this study, we describe dental and postcranial material from Simbakubwa kutokaafrika, gen. et sp. nov., the most complete hyainailourine known from sub-Saharan Africa. The material is from a relatively young adult from the early Miocene locality of Meswa Bridge, Kenya. Simbakubwa differs from Hyainailouros in exhibiting lingually oriented molar protocones, gracile metastyles, and buccolingually compressed, shearing canines. Like other large Miocene hyainailourines, Simbakubwa has deep carnassial notches on the molars and tall paracones fused to shorter metacones forming single piercing cusps. A Bayesian phylogenetic analysis recovers Simbakubwa as the sister taxon of a clade of large-bodied Miocene hyainailourines that includes Hyainailouros and Megistotherium. Bayesian ancestral state reconstruction supports an Afro-Arabian origin for Hyainailourinae with subsequent dispersal to Eurasia during the early Miocene. Regression analysis based on carnassial size is applied to Simbakubwa and closely related hyainailourines, recovering a body mass up to 1,500 kg for the new taxon. The evolution and extinction of Hyainailourinae offers important insights for interpreting ecological transitions from Paleogene to Neogene faunas in Afro-Arabia and Eurasia.